It will take decades to solve the women in tech problem. Let's work harder. Added on March 25, 2017 by Chris Saad. Tragic result from Stack Overflow yearly survey. 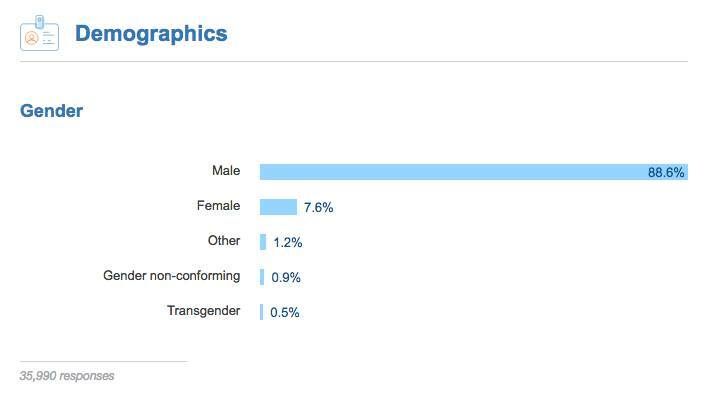 Gender of engineers in their community is 7.6% women. At the risk of stepping on a land mine, I've heard people get upset when the issue is described as a 'pipeline problem'. But I'm not sure how else to read these numbers. The engineers aren't out there. We need to collectively do a better job of fostering women in tech from cradle to ceo. This will take a long time. It took decades to create this problem and it will create decades to fix. Let's redouble our efforts.